Somehow February went by and I didn't post a single time, though I did post on my teaching blog as part of the Ed Psych class I'm taking. I am just like my students: give me three points and I'll do it, no points and I won't. 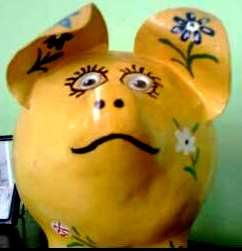 I met this pig today at the Salvation Army Thrift Store. Odd and abandoned craft projects are pretty much my reason for living (along with partner, child, nature, and art). I experienced a serious moment of recognition. Mutual, I like to think. 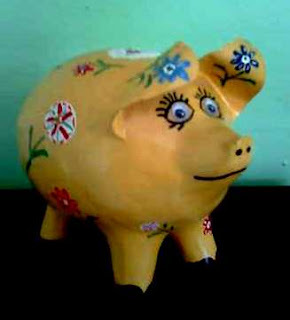 This pig would simply be quaint if it weren't for the googly eyes, which make the pig. 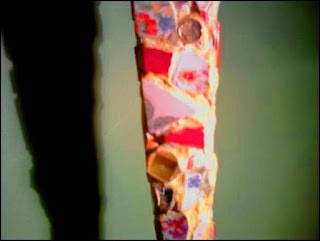 Here's a detail of a garage sale lamp from a few years back - broken plates and buttons cast in yellow.